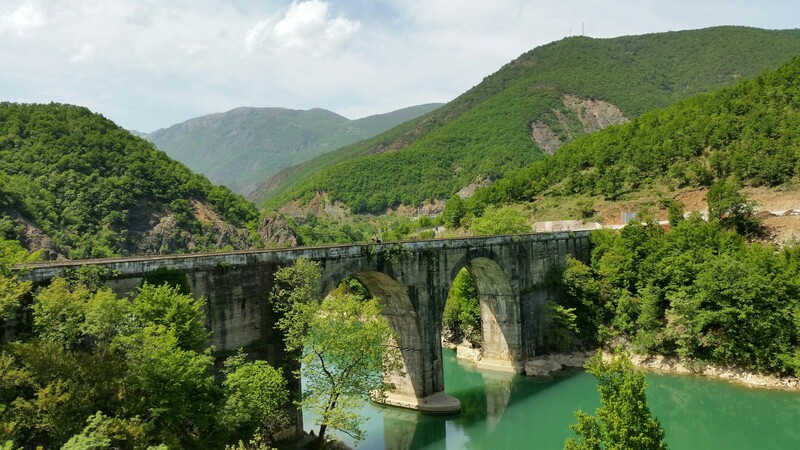 After two months travelling through western Europe, entering Albania felt like we’d entered a new continent. Arriving from the rural calm of the Montenegro mountains the border at Sukobin was suddenly there in full noise and colour, with long seperate queues for cars, buses and ‘travellers’. We joined the travellers queue with the scooters, motorbikes and bicycles all trying to flash their cards and bypass border control. Once on the Albanian side two policemen approached and did the usual ‘where are you from’ ‘where are you going’ set of questions. Border crossings are always a bit unnerving and especially when entering a new country late in the afternoon, being aware that you need to get on and find a place to camp, but also needing to take time to get used to your new surroundings, so we were both a bit on edge. Then came the ‘oh you must be so rich to be able to travel for a year and not work’ comment. I’d expected this question at some point on the trip, but it caught me off guard and made me feel a little uneasy, especially when after further discussion it turned out that the policemen were from Italy and Germany and were on secondment in Albania. Compared to many Albanians we are better off, but we worked and saved hard for this trip, we wild camp and cook our own food to keep costs down as much as possible. He seemed to understand and then proceeded to give us a long list of warnings about Albania - of note: ‘Be careful of the drivers’ and ‘Watch out forthe potholes - they’re so big they’ll swallow you up! No, actually, they’ll swallow you both up! This turned out to be valid advice, so I guess we have something to thanks them for! So, for me anyway it was an uneasy start to Albania. Apart from the crazy drivers, pot holes and barking dogs the other thing to get used to is the number of men that just seem to hang about in cafes or on the side of the road. They were all respectful but it’s just another change to get used to. I read somewhere that foreign countries ‘are not designed to make tourists feel at ease, they’re designed to make their own people feel at ease’ - of course - it’s just something to keep in mind. This however made us laugh! Why seal the whole road when half will do fine?! 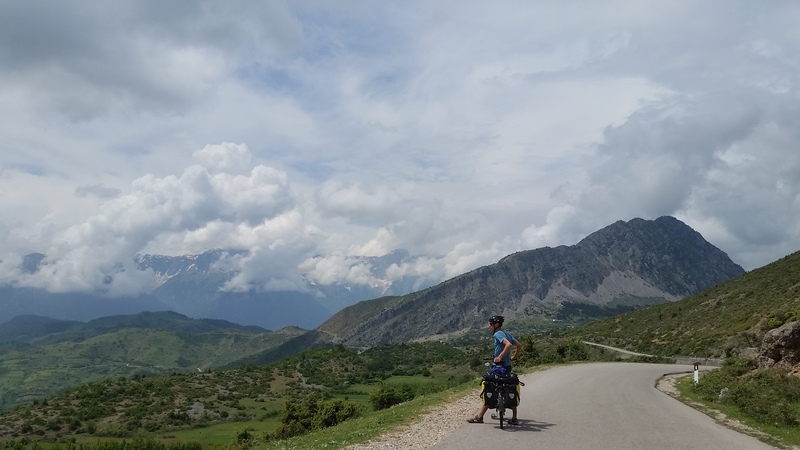 Jules didn’t get off to the best start either, after a dreamy flat section of road we hit 10km of crazy potholes in the mid morning heat and, after stopping in Lezhë for lunch, discovered he’d lost a chain ring bolt and our water bladder had sprung a leak. Another 10km down the road his bottom bracket came loose again (first time was in Switzerland). A local mechanic was luckily on hand withsome tools to tighten it, however another 3kms down the road it slipped again! 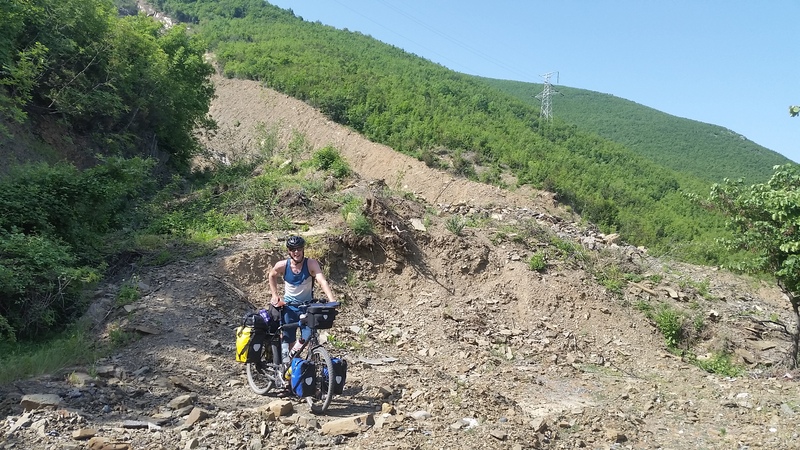 By now it was 5:30pm and we were heading for the countryside so with fingers and toes crossed that the small bike shop we had passed earlier in Lezhë would still be open we pedalled speedily back the way we had come. Luckily it was, he had the right tool, and with some almighty strength (which made Jules wince in fear that he would break the bike), he tightened it up. Now to find somewhere to sleep…a mosquito infested field just outside Lezhë, why not? All made up for in the morning with a beautiful sunrise and display of swallows diving, bliss. 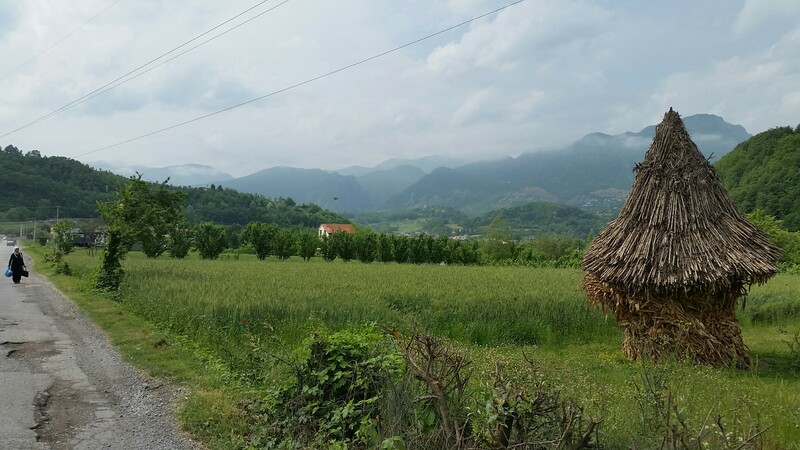 Our route out of Lezhë was interesting…in trying to avoid the A1 motorway we took a side road, which was very quiet for good reason - a huge landslide had blocked the road! The good thing about bikes is thats they’re pretty mobile and with one person pushing at the front and one at the back, they can get past most obstacles no problem! 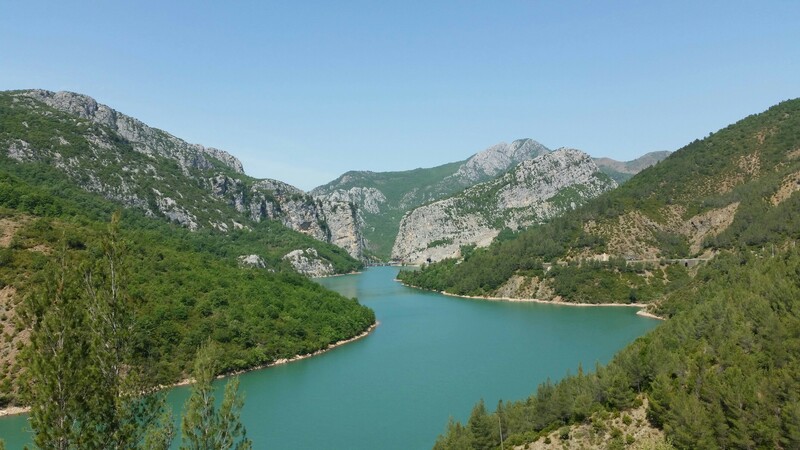 Onto State Highway 6, a great road winding up the river in Ulëz National Park and then up and down the ridgelines towards Burrell where Jules started to feel distinctly average. We camped at the quiet church campsite ‘Camping Suc’, a good thing too as Jules spent the next 8 hours projectile vomiting. At least we were well looked after there! It’s amazing how weak you feel after just a day of little food, so we took it slow but it was a hot and humid climb up to Bulquize where there is a large silver mine. At least you are always encouarged up hills (and down in fact) by a friendly toot from passings vehicles. You even start to get a bit disheartened if a vehicle passes and doesnt toot! Sheltering from an impending rainstorm in a small roadside shop we were given the weather forecast for the next few days by a local 10 year old - ‘Oh no, no, no! Macedonia, rain!’ Oh well - it is what it is and after eventually setting off in the rain we felt infinitely better when cycling up another small river valley and looking across to see three loaded touring bikes coming down. It was our French friends who we had met in Croatia who were now joined by their friends on a tandem. We had a drink in Çernenë and asked the bar owner if there was anywhere we could camp nearby. Amazingly the bar owner across the road spoke fluent French and told us we could sleep in the fields behind, next to the mosque. So we cooked supper with friends, surrounded by 20 Albanian boys and a pack of stray dogs. We were knackered, it was good to have company! 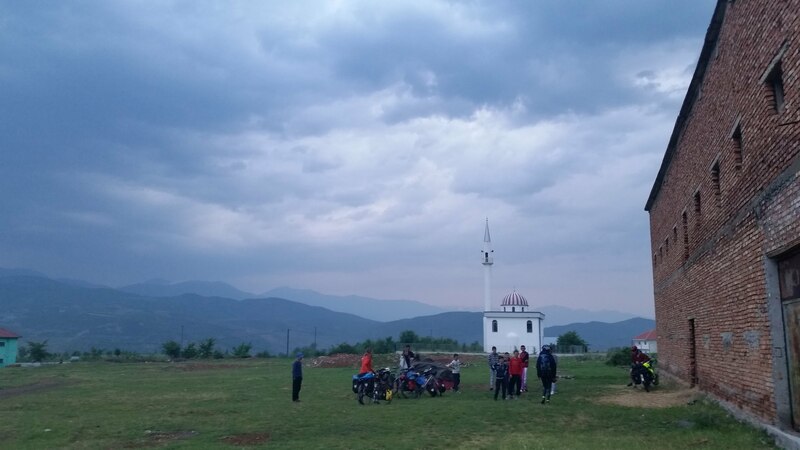 It was a short ride to the Macedonian border the next morning where we spent the next few days. See Macedonia blog page. We entered back into Albania on the eastern side of Lake Ohrid. 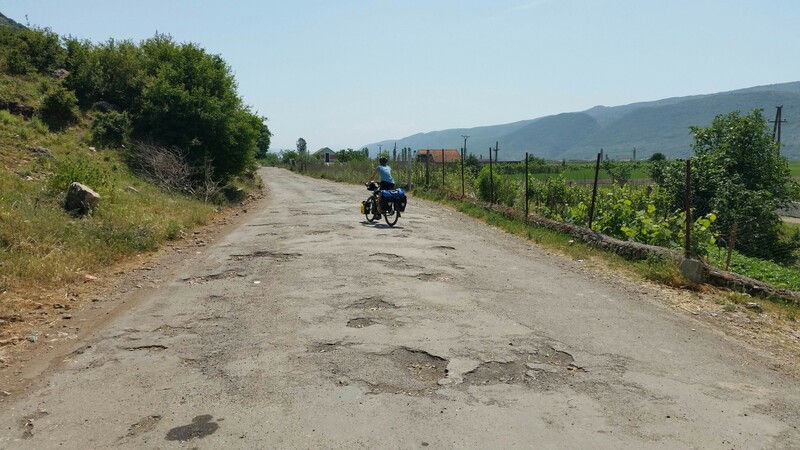 We tried to avoid Pogradec by taking some back roads, but these were poor farm tracks - not recommended! 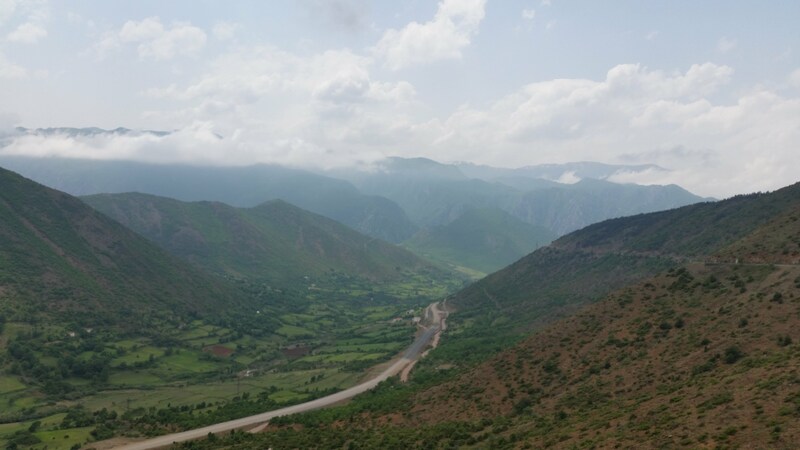 Joining SH3 for a bit was busy but managed to turn off towards Podogorie and had a beautiful ride along the valley side into Korçë where we were greeted by another rainstorm! 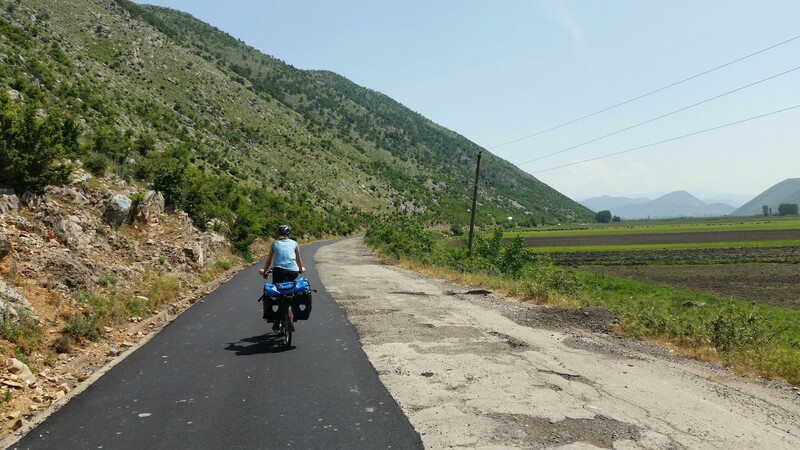 There’s a new section of road on SH75 abou 10km out of Korçë. We took the old road which was much more scenic, quieter and generally more interesting winding up the hill through forest. The new road cuts an ugly linear scar in the landscape and still reaches the same height. The catch with taking the old road (as ever in Albania) is that it suddenly ended! So we had to walk the bikes up and over the rise to meet the official road again, although by this point it’s back to a winding mountain road so good descent! Albania is obviously on a big road building project as there are several sections of SH75 we saw being drastically re-routed. The mountain routes we took were mainly good, once you get used to riding on the opposite side of the road from the potholes, so hopefully some are maintained. 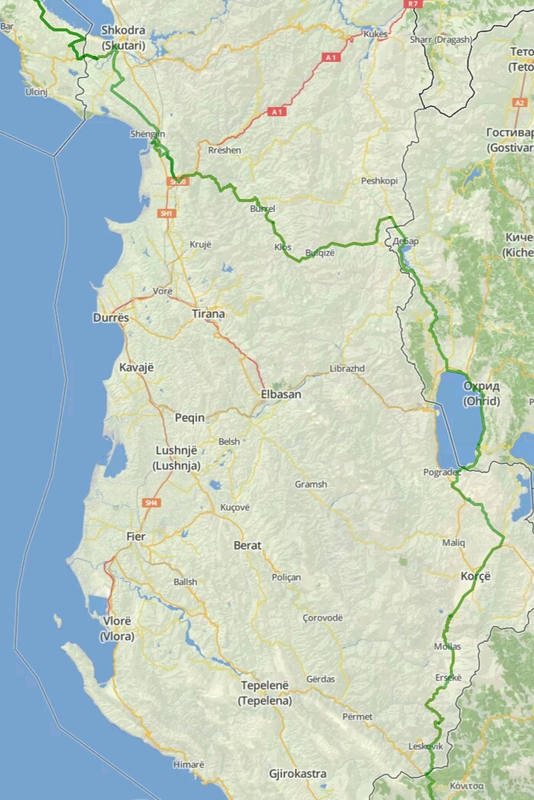 Having said that, we followed SH75 to Leskovic and then took SH65 to the border with Greece, which was without doubt the best road we did in Albania - smooth, wide, gentle turns downhill. A new section of SH75 being built. The current road winds along the mountain side. Great for cyclists but not so good for trucks. Albania ranks 120th on the GDP index and 13th on the Happy Planet Index, well above the UK (34th) and NZ (38th) - a telling statistic. 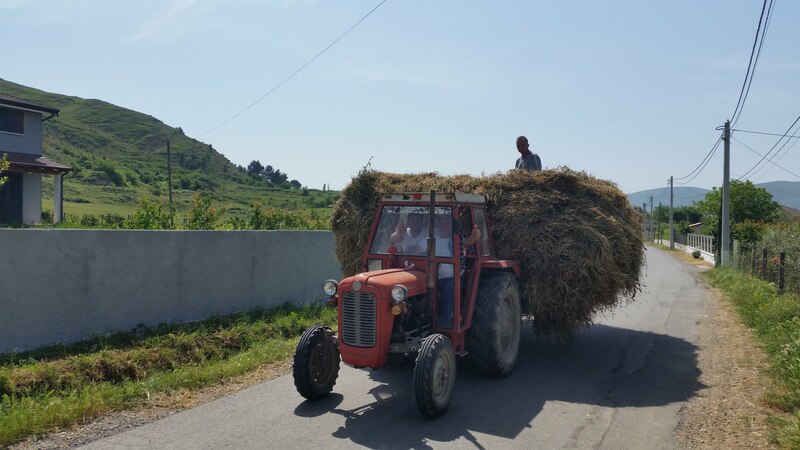 Whilst life seems fairly baisc and subsistence farming is still common in many areas of Albania, we saw nothing but smiles on the side of the road. Albania, we got of to a hard start, you were tough, beautiful, welcoming and warm, you had the last laugh! Always a friendly smile, whatever the vehicle that passed.